Opening my mail at the end of September I read, "Congratulations: You Won The Lottery! You have been selected to attend the Casting for Recovery Canada Retreat October 26-28, 2007 at the Franklin Fishing Club, Ontario." WOW! It continued, "We are looking forward to your participation in the third annual Casting for Recovery Canada Retreat in Ontario" and that I would receive information of my hotel location, and the final group attending in the following weeks. WOW again! The advent of this adventure had begun while I’d circled, waiting to land in St. John's NL last June. The weather was foggy and, unable to land, our flight was re-directed to Halifax. After sitting in a plane, circling for almost two hours, there was an urgent need to visit a washroom, and as a group of us were in a queue, I noticed the brooch on a lady a couple ahead of me. I commented that it was a unique and beautiful pin. "Thank you, it’s a breast cancer pin", came the reply. I said that I recognized the symbol, as I am a breast cancer survivor. I was speaking to Kathryn Maroun. Kathryn is the Host of "What a Catch", one of the best fly fishing shows on television today. She travels to many exotic places catching species of fish very few fly fishers ever get a chance to pursue. 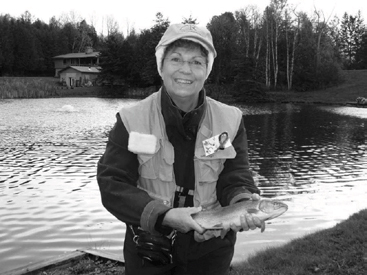 Kathryn is the only FFF (Federation of Fly Fishers) certified female casting instructor in Ontario and is the President of Casting for Recovery Canada. Well, from there we continued to talk. She let the person in front of me go ahead, and she inquired if I had heard of Casting for Recovery Canada. I told her that I hadn't, so she gave me a quick rundown on the program. 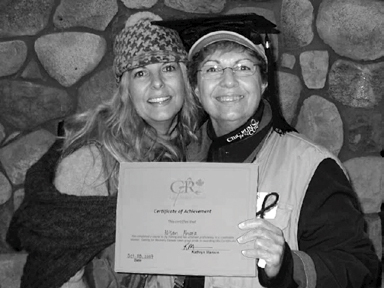 CFRC is a national non-profit support and educational program for women who have or have had breast cancer. It provides an opportunity for women whose lives have been profoundly affected by the disease to gather in a beautiful, natural setting and learn fly fishing, a sport for life. CFRC offers no-cost fly fishing retreats that incorporate counseling, educational services and the sport of fly fishing, to promote mental and physical healing. I told her who I was and of my involvement with Breast Cancer Action Kingston, giving her one of my cards (as she had run out of hers), and she promised to send me some additional information on CFRC. The facilities on the flight became available and we moved on. 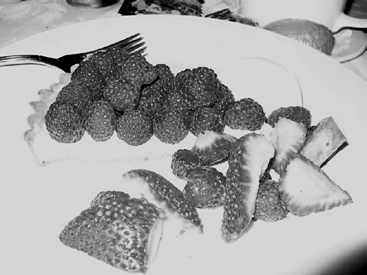 That was the last I saw of Kathryn at that time. Upon my return home, I checked the website for CFRC, www.castingforrecovery.com and I registered online. "Congratulations..." I won the lottery! In October I traveled to Toronto, to the Airport Sheraton Hotel. After checking in, our group met prior to dinner. We were a group of ladies from all across Canada, from British Columbia to Nova Scotia. Kathryn explained what we would be doing over the course of our weekend. We learned all about fly fishing and the equipment we would be using. This was going to be exciting, but we all felt it would also be challenging. Quoting from one of Kathryn's handouts: "Why Fly-Fishing and Breast Cancer? Fly fishing and the casting motion provide a movement for joint and soft tissue stretching. The dynamics of fly fishing relieve everyday stressors and provide a sense of calm. In addition, attending a CFRC retreat provides an opportunity for social support and spending time in a beautiful, natural setting. The focus of the retreat is on wellness." On Saturday, we visited the CN Tower, where we enjoyed a wonderful lunch at the top of Toronto. We challenged ourselves on the glass floor and then practiced our casting techniques out on the concourse with the real rods and line, minus hooks of course. Dinner was at a lovely restaurant that Kathryn knew and the food was unbelievable, especially the dessert! We all traveled back to the hotel for "evening circle". Sunday morning, it was check out and we’re GOING FISHING! A bus picked up an excited group of ladies and off we went to the Franklin Fishing Club in Mount Albert. We were greeted by members of the club in their beautiful club house and were taken to Harrison Pond, where we were paired with a guide. What a beautiful location. Our weather was not so beautiful-it started to snow! Small white flakes, and when you fly fish you don’t wear gloves. But it didn't last long. The sun came out and I caught a fish. Around the pond there were squeals of delight and excitement as each of us caught fish. It is "catch-and-release", so we take a quick photo and the fish goes back into the pond for another day. This experience was followed by a tour of the Fishing Club and a BBQ with the members before we headed back to the hotel and on to our respective homes. To Kathryn and her organization, I would say a heartfelt thank you for the opportunity to participate in such a wonderful experience. From our sharing time, learning how to cast and catching fish (three! ), wonderful food and great fellowship, this was a very special time with wonderful new friends.